Just 3 more days before school starts here in Texas...and I am both excited and sad about it! I'm mostly excited because of the bentos that I'll be preparing for Clarise and Cherlin. This is the first school year that I will be doing this, so both the girls and I are looking forward to it. I just can't wait to see how far could my creativity go! If you read my post the other Friday, you know why I'm sad and I don't want to talk about it or else I'll be in tears again...so let me just share with you this cute bento that I made yesterday. 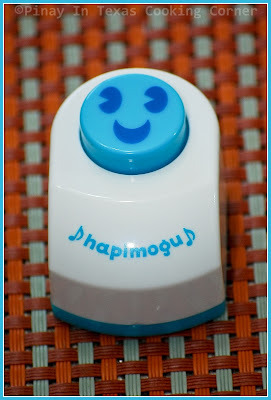 Cherlin named it Happy Girl Bento. This is basically rice with buttered mixed vegetables and a happy girl's face made of squid ball with beef frank hair. 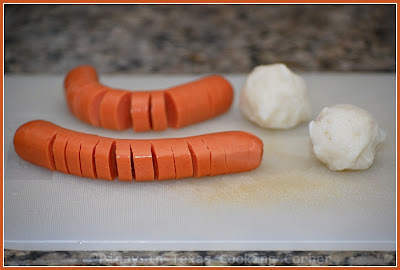 For the beef franks, just cut some lines on them and then cook them in boiling water together with the squid balls until they are all heated through. Remove from heat and drain on a paper towel. Then I sprinkle the rice with this Salmon Furikake. For those who aren't familiar with this, "furikake" is a Japanese condiment which is meant to be sprinkled on top of rice. It is a mixture of dried and ground fish, sesame seeds, chopped seaweed, sugar and salt. Salmon, egg, powdered miso and vegetables are often added to the mix. The one with salmon is our favorite. I plan to do bento for the girls everyday starting next week as long as time permits me...so watch out for more bento ideas here! I'll be sharing them with you every Friday! Aaah so Kawaii!!! I hope I do this for my kids when I have some. Love it! Wow! You're getting better and better each day Tina! That is so cool and very creative!! Too cute! love your creativity. The sausage girl is SO CUTE! How creative!!! 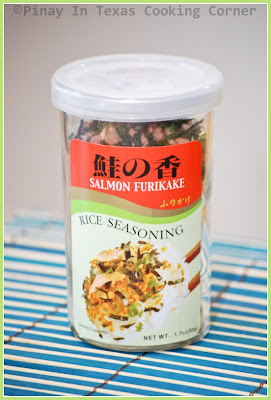 You should check out there's no MSG version of the same furikake. We use that one. =) Your girls are lucky!! Your "happy girl" is just adorable! What a lucky daughters! So cute. I love it. You are so creative. Awww Tina those are too adorable.here in TN it already school started two weeks ago..You are my go to girl for the inspiration. Have a wonderful Sunday! Tina-This is so darn cute! I've seen the Bento around on a few blogs, and the Happy Girl Bento is so adorable. Love your creativity...for sure it will make happy girl (s) with such fun lunch packed, and so yummy too! did i say before that I have decided to call you Bento queen ? 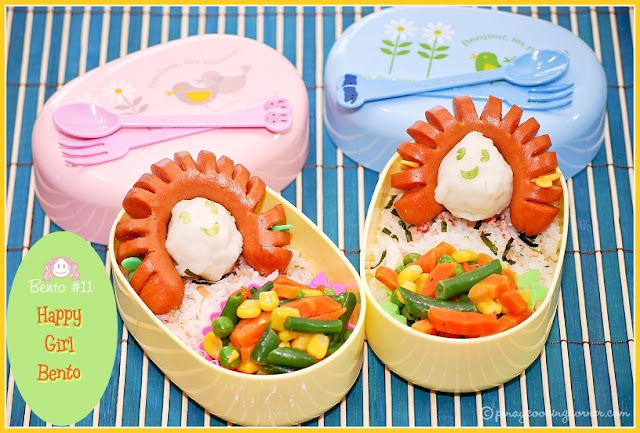 :) You make such damn cute bento.. very creative! Oh so cute! Your kids are so luckY!